All praise be to Allah, Lord of the Worlds. The Beneficent, the Merciful. Owner of the Day of Judgment. 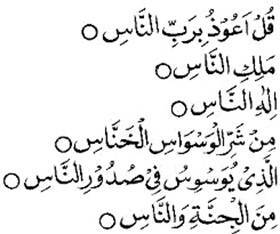 You (alone) we worship; You (alone) we ask for help. Show us the straight path, the path of those whom You have favored; Not (the path) of those who earn your anger nor of those who go astray. 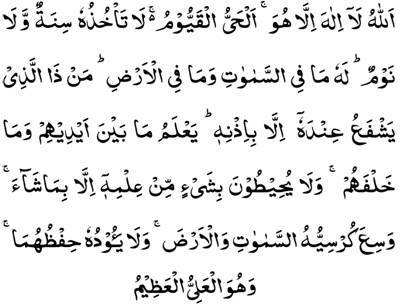 Allah, there is no God except Him, the (Ever) Alive, the Self-Subsisting (Sustainer of existence). Neither slumber nor sleep overtakes him. Unto Him belongs whatever is in heavens and whatsoever is in earth. Who is he, who intercedes with Him except by His permission? He knows that which is in front of them and that which is behind them, while they encompass nothing of His knowledge except what He wills. His throne includes the heaves and the earth, and He is never weary of preserving them. He is Sublime the Tremendous. Say: O disbelievers! I worship not that which you worship. Nor worship you that which I worship. And I shall not worship that you worship. Nor will you worship that I worship. Unto you your religion and unto me my religion. Say: I seek refuge in Lord of Daybreak. From the evil that which He created. From the evil of the darkness when it is intense. And from the evil of the malignant witchcraft. And from the evil of the envier when he envies. Say: I seek refuge in Lord of mankind. The king of mankind. The God of mankind. From the evil of the sneaking whisperer. Who whispers in the hearts of mankind. Of the jinn and of mankind. O Allah ! Confer blessings upon (Holy Prophet) Muhammad and upon the progeny of (Holy Prophet) Muhammad as You conferred blessings upon Ibrahim and upon the progeny of Ibrahim; indeed, You are Praiseworthy and Glorious. O Allah ! Bless (Holy Prophet) Muhammad and the progeny of (Holy Prophet) Muhammad as You blessed Ibrahim and the progeny of Ibrahim; indeed, You are Praiseworthy and Glorious. Glory be to Allah, All praise be to Allah; There is none worthy of worship besides Allah; and Allah is the greatest There is no Power and Might except from Allah; the most High - The Great. There is none worthy of worship besides Allah; He is one He has no partner; His is the Kingdom and for Him is all praise; He gives life and causes death; in His hands is all good; And He has power over everything. 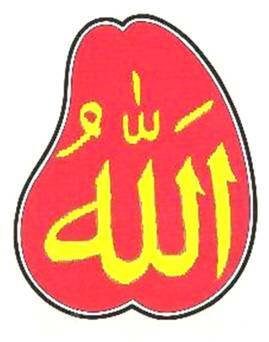 There is none worthy of worship except Allah; Muhammad is the prophet of Allah (Sal Allahu Alaihe Wa Aa-lehee Wa-sallam ). 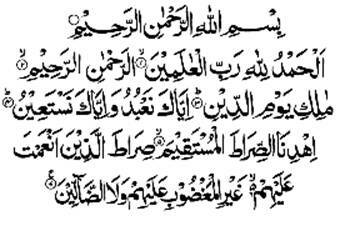 After reading all above each for three times, he should blow the air from his mouth on his chest and on his both palms then caress his hands over all of his body.